1. Project Import in the “Project Library”. Will import older projects, versions 5,6,7 and will export a copy of a VSD8 project. It will make a copy of all the older files selected and a new .pyr. 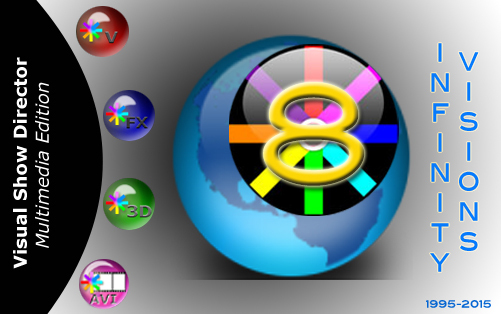 Export will export to versions 5, 6 , 7 or make a copy of version 8 projects and selected files. 2. Direct open/import from the “File menu” of “Scripts”, “Effects Manager”s, Sorts and Filters from versions 5,6, and 7. Copies of original version files will be saved as “samename”. “file extension”.bak in the same folder. Older projects can not be opened directly from the File Menu, they need to be imported with Project Library. 3. Project Save As… Makes a copy of the existing .grx and .atb files and copies them to the new project before it saves. This fixes the missing column colors/formatting in the new project if the script windows was closed.4. Automatic version update notifications.5. You can now associate ShowDirector8 to .pyr project files. This allows you to double click a .pyr project file and have ShowDirector open with that project loaded. 6. New Auto Restore for Scripts and Effects Managers. This new function will keep a back up of your most recent Scripts or Effects Managers making a copy of the files every 5 minutes within 1 hour. There will be 12 copies that you can restore at any point on time. The feature is only active with a project open. The backup files are stored in a folder inside the directory where the project is saved.The function can be manually deactivated by changing On to Off in the file sd.ini in C:/Users/username/Appdata/Roaming/ShowDirector. You will never loose more than 5 minutes of work. 7. Added new Script columns; MS (MILLISECONDS),MACRO,GROUP,TABLE,MODE, CONTROLLER, MODULE, PIN, CUSTOM 3>8, LOCK1 > LOCK 8 columns added to Script. Included in Filter and Sort. This supports different firing system functionalities. The new columns are initially hidden and you can show them with the show/hide tool in the format toolbar. 8. Added new columns to Effects Manager grid: Custom3-5. The columns from Effects Manager overwrite the values in Script Manager. Script Manager. also got three additional Custom (6-8) that do not get over written as they don’t exist in effects. All new columns are shown. REF column widened from 16 to 50 characters. 9. All ShowDirector Managers Grids now support Column Cut and Paste. It is limited to columns on the same grid and of the similar data types. Some data types can’t be copied between columns (for example, while you can put a CUE number into a text field such as CUSTOM3, you can’t put that CUSTOM3 value back into the CUE). To copy a column or a section of it: select the cell to start, press Shift and select the last row, press Shift-F4 or the icon tool in the Sort/Filter toolbar, click in the cell you want to start the paste and press Shift+F5 or icon tool. 11. The Script Open and Save As and have been expanded to include the new columns. Script Open from .xls, or .csv and older scripts (VSD 5,6,7) that do not have the new columns. The new columns will be blank. Columns in Excel have to be named with the same characters and format as VSD. Excel with one workbook has to be named as “Sheet1”. The Effects Manager export and import has .csv and Excel (.xls) format. 12. New Renumber Address dialog for ADDR and Module/Pin will dynamically display the Script Sort you have (up to 10 columns) that can be selected to cause the Renumber to increment to the next Module when that value in that column changes. It also allows you to specify if you want the pin addresses to increment or decrement (default). Once a module is full, we increment to the next module. The Reset Address also has a new dialog that allows you to specify either ADDR or MODULE/PIN columns (or both) for reset. 13. The Validate Addresses form has now a Module Report function that will display a count of Total Firing Modules and available pins not used. 14. Reset Address, Renumber Address and Validate Address now work on both ADDR column and the new MODULE/PIN columns. When you run the menu items, it works on both the ADDR and MODULE/PIN. 16. Cue Time (HH MM SS FF) remain in frame rate. We have added a MS (milliseconds) column that contains the Cue Time represented in total milliseconds. If you change any of the Cue Time values, the MS column will update. If you change the MS column, the Cue Time values will update. 17. The Next column has been changed to allow edits. This makes the interval between two cues as settable. If you change the value of in the Next column, the Cue Time and MS will update. If other Next values exist, than all following Cue Times will also update with their intervals. Thus, if you change a Next time interval, you slide the entire show by that much time. How this effects the show can be manipulated by the filters and selections you have in place at the time of the edit to the Next value. CopyDown and AutoComplete also works for the Next column allowing you to generate linear and curved interval sequences. A valid Next edit can be as a number from 1 on up as milliseconds or in the format of mm:ss:ms (minutes, seconds, milliseconds), however the display will always show mm:ss:ms. It is also possible to Copy parts of the NEXT column and Paste in other Cues to set the same intervals. 18. Increased the precision of the PFT (Pre-Fire Time) from 1/10s of a second to milliseconds. You can enter any number from 1 (millisecond) to 9999. Zero is still valid and indicates no pre-fire time. This change should be reflected in both the Script and the Effects files. When exporting to previous versions it will reformat the PFT as 1/10 sec. When importing from older versions it will convert 1/10 sec into milliseconds. When creating the Firing Table .tab for the PD Field Controller it will export as 1/10sec. 19. Configure Timecode form now allows to change the Frames format of the open Script. If you are in 30fps and select 25fps the Script will change to that format. 21. Script and Effects QuickFilter are additive now. If you have a filter in place and select a new QuickFilter, it will add to the end of the existing filter. This continues until you select Reset Filter. 22. Added Major Version number (8) to the .grx and .atb filenames. This will help facilitate the organization and addition of new columns and tools to ShowDirector. The default toolbar (.atb in appdata/roaming/ShowDirector) when it opens does not show all the toolbars possible. To Open other tools bars, right click in the grey area and select them from the menu or from Customize. 23. LAYOUT FILES for each of the grids in Show Director. Saving and Loading of the layout files is done from a new Grid Options dialog. To save or load a grid layout, select the grid and press Shift+Home. Saving your grid layout will save the foreground and background colors, fonts, column hide/show, column order and column width. Loading will restore these values. Each type of grid (Script manager, Script Filter manager, etc.) has its own layout file format and its file extension will be that of its grid + ‘l’. For example, the Script manger’s extension is ‘.scx’ and its layout file extension is ‘.scxl’. Each layout file contains the layout for only one grid type. Layout files are not Project specific so you can load your layouts on any grid in any project. 24. ToolbarLayout (.atb) and GridLayout (.grx) files gained the Minor version number. This means if a menu changes or a grid column changes, we will advance the product Minor version and refuse to load the old, out-of-date layout files. A side effect is that any custom formatting in the old version is lost to the new version. Default .atb and .grx files in the users/AppData/Roaming/ShowDirector folder have been made Read-Only to preserve them against possible corruption by loading out of date script or effect files when no project has been loaded.